Welcome to the home page of Vetoni's Italian Restaurant. 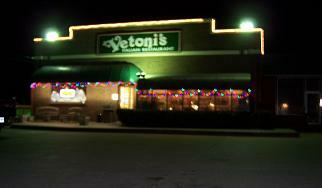 If you love Italian food and enjoy fine dining, Vetoni's is the place to go in Gun Barrel City, TX. A Beautiful water fountain is the center of attention in the main dining area surrounded by artwork, grapevine, soft lighting and authentic Italian music. Vetoni's offers a variety of Italian dishes prepared and baked to order by our well trained chefs. Owners Michael and Shay Lowther are very proud of their recipes, and the chefs who prepare them. Baked Italian dishes such as Lasagna,ravioli, manicotti and cannelloni, are served hot and fresh with salad and garlic rolls. The seafood includes linguini with clam sauce, and shrimp alfredo. Veal, chicken and eggplant are also served. For customers with less adventurous appetites, there is the traditional bowl of spaghetti, and individual sized pizzas. Remember, the meals are prepared fresh as ordered, so be prepared to wait. The Lowthers' feel that preparing and baking the dishes individually enables them to provide the customers the very best food that they can offer. For dessert, Italian Rum Cake, Spumone Ice Cream and Cheesecakes are served eloquently on glass plates. The cheesecakes comes in a variety of flavors including Chocolate, Black Forest, Strawberry, Amaretto, Key Lime, Plain and, my everyones favorite, Turtle. The restaurant is unlicensed to serve alcoholic beverages, but the customers are welcomed to bring their own bottle of wine or favorite beer to enjoy with their meal. Vetoni's will glady furnish wine setups which includes the wine opener, wine glasses and ice bucket. Vetoni's Italian Restaurant is an ideal place for business lunches or an intimate dinner with friends and family. Vetoni's is located at 428 North Gun Barrel Lane. Lunch and dinner are served Sunday through Thursday from 11:00 to 9:00, Friday and Saturday from 11:00 to 10:00. Most major credit cards are accepted and gift certificates are available. Weekday reservations and take out orders can be made by calling (903)887-5846. Click on the Link above to view our menu. 428 N. Gun Barrel LN.